There is a pivotal scene in An Education. It’s not obviously so, but I think the entire film comes down to that moment. It’s where we find the thesis statement, or whatever it is they call it in films. Jenny confronts the Head Teacher of her school and in an impassioned speech she questions the value of education for the girls at the school. Jenny focuses on women, but it can be a question for any confused scholar. What’s the point of an Education. Why not agree with Alfred Camus and agree that’s it’s all for nothing. It only makes you bourgeoisie and the end we all will die anyway. The Head Teacher doesn’t have an answer; in fact Lone Scherfig doesn’t seem to either. Instead the question is, if not an education, then what? That moment in the film is Mulligan's. Up until that point she has delighted us. She’s made us laugh, sometimes even a little wistful. She’s done what she must, and done it excellently. But in this moment, the moment most unlike the Jenny we’ve come to know is also the moment where we see more of Jenny than we’ve seen before. It’s a beautiful moment for Mulligan, it’s a great moment for Emma Thompson, for Lone Scherfig and for the audience. Haven’t we all been there? Perhaps, not as students; but we do eventually start to question the things we’ve come to appreciate. Religion, family, life...? Maybe I’m projecting, but in being completely unselfconscious about it; without trying to make it more than one person it seems to be so much more. Every time Carey puts on that enigmatic face of hers, I’m never quite sure what she’s thinking. It’s the reality that we never completely know anyone, especially movie characters. I don’t see Jenny as a saint, although others have, she’s not that likeable anyhow. But she is appealing. It’s Carey Mulligan and those layers. And yet, I’m not remembering Carey alone. I switch sides by the second when I think who’s the best in show. Mulligan? Perhaps, but isn’t that too obvious a choice; as is Alfred Molina. He’s perfect as Jack, Jenny's father. I’ve heard some calling him a hambone. ‘Tis a pity. I know a few quite like him. It’s sad really. It’s more than living vicariously through his daughter. That yearning, for something more while quite pedestrian is surprisingly poignant. It’s one of the strongest male performances I’ve seen this year, and it’s a pity no one’s taking any notice. Cara Seymour is sadly wonderful as his wife. She’s not a mouse of a woman, but it’s sad to watch her try to combat her husband. One can only imagine how much she hopes to accomplish with her one child. And what of the three Musketeers? 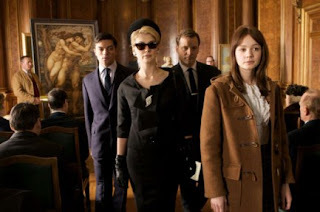 Dominic Cooper, Rosamund Pike and Peter Sarsgaard. I’m so grateful that the SAG have recognised this film. Rosamund lights up the screen every time she’s there, her line readings are among my favourite of the film and that constant vacuous look on her face is some exceptional acting. In my opinion of course. Sarsgaard is more than a slimy grease ball here. He just may be the most pathetic of the film’s characters. His desire to remain young is obvious, from his relationship with Jenny, to his car, his friends – it’s all very sad. 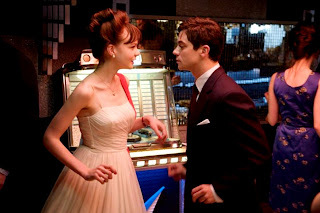 And as much chemistry he and Mulligan have, the most romantic moment of the film is almost a throwaway as Cooper and Mulligan take to the dance-floor together. I was probably reading too much into it, but it was almost as if something was going on there. Cooper too, is a revelation here in an almost nondescript role. And the teachers? I feel as if I know them. Olivia Willaims' Mrs. Stubbs is as real as any of my professors. I thoroughly understand her desire for Jenny to succeed as much as I can understand Thompsn’s Head Mistress’ dilemma. The reverence, fear and glamour of that dreaded principal’s office. That I can understand. But An Education is a bit of anomaly as far as I’m concerned. I’m not conceited enough to think that my thoughts are golden, but usually when I decide upon a film I whole-heartedly adore I can’t understand why others don’t. But with An Education I can easily understand why others wouldn’t find it that appealing, or honest even. Certainly the ending may just be a little too pat. But life is never that tragic as movies would have us to believe. I still want to go and out make everyone watch it though, even though I’m sure many may not be half as enthralled as I was. But I’ve had An Education, and it’s been rich. Isn't it wonderful? As I said, a genius film. Rosamund Pike is superb. I myself have seen it, liked it a lot because it made me feel good and it was like a personal experience, but it's hard to remember it exactly now... or say what's my favorite moment. What keeps growing in my memory is the acting of Carey and definitely Emma, who gives the best scene. or maybe 2.
i'm curious how you'll feel about it in a month or so, without revisiting it. ...and I've finished The White Ribbon, which just like Cache is brain damaging. i won't say more. Can Carey Mulligan really win the Oscar? Meryl Streep is still waiting and Sandra Bullock wants her first. joe sorry. i'm one of them who loved it. walter good call on pike, there. and yes is is wonderful. alex well i saw it since wednesday :) when i do my year end review [at the beginning of feb.] i'll see if it holds up. about the white ribbon...please don't be vague! daniel i honestly don't know. the role is so subtle, and the last perf. like this to get Oscar love was [ironically] emma thompson in howards end. it's thoroughly british, very understated and not showy. so far, i think she does. So happy you loved it! An Education is really terrific, definitely one of the best of the year. jude glad you liked it.